To make the cupcakes, preheat the oven to 350˚ F. Line standard cupcake pans with paper liners. In a small bowl, whisk together the cocoa powder and hot water until smooth. In a medium bowl, whisk together the flour, baking soda, baking powder, and salt; set aside. In a medium saucepan, combine the butter and the sugar over medium heat. Heat, stirring occasionally to combine, until the butter is melted. Remove the mixture from the heat and transfer to the bowl of an electric mixer fitted with a paddle attachment. Beat on medium-low speed, 4-5 minutes, until the mixture is cooled. Mix in the eggs and egg yolk, one at a time, scraping down the sides of the bowl as needed and beating well after each addition. Mix in the vanilla and then the cocoa mixture and beat until incorporated. With the mixer on low speed add in the dry ingredients in two batches, alternating with the sour cream, beating just until combined. Divide the batter between the prepared cupcake liners, filling them about ¾ of the way full. Bake 18-20 minutes or until a toothpick inserted in the center comes out clean, rotating the pans halfway through baking. Allow the cupcakes to cool in the pan 5-10 minutes, then transfer to a wire rack to cool completely. To fill the cupcakes, cut a cone out of the center of each cupcake with a paring knife. 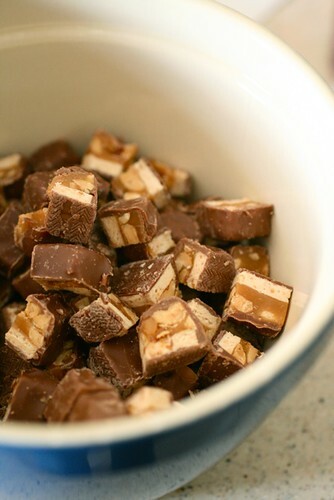 To make the filling, combine the chopped Snickers bars in a bowl with 1/3-½ cup of the caramel sauce, and mix to coat. 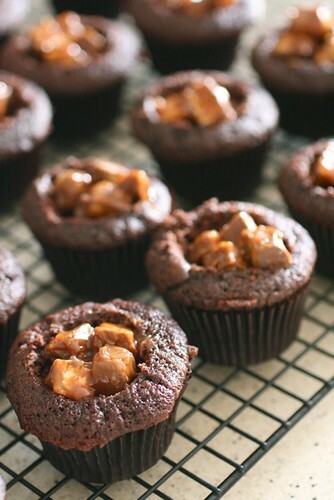 Drop a spoonful of the filling mixture into each cupcake. To make the frosting, add the butter to the bowl of an electric mixer. Beat on medium-high speed 1 minute until smooth. Blend in the confectioners’ sugar until smooth, 1-2 minutes. Mix in the vanilla, caramel sauce and salt until incorporated. 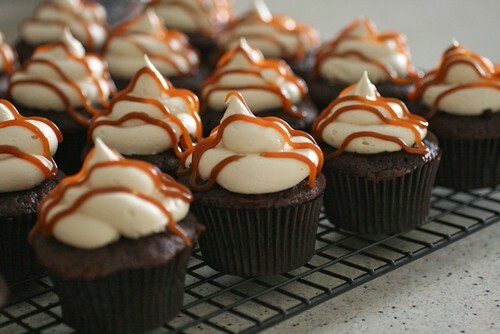 (Note: the caramel sauce should be just warm enough that it is workable, but not warm enough to melt the butter in the frosting.) Add the heavy cream and whip on high speed until light and fluffy, about 3-4 minutes. Transfer the frosting to a pastry bag fitted with a decorative tip. 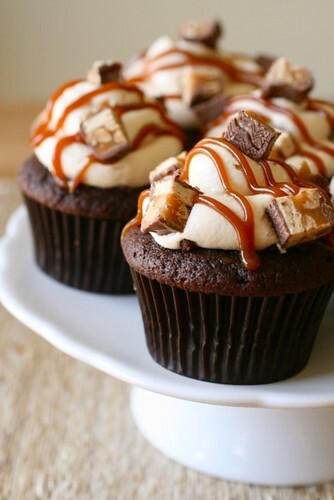 Drizzle the frosted cupcakes with additional caramel sauce and garnish with chopped Snickers bars.